I have been using Ableton Push in my duo with Trevor Henthorn (Made Audible using Ableton Live) for around a year now, and absolutely loving it in the studio and on stage. 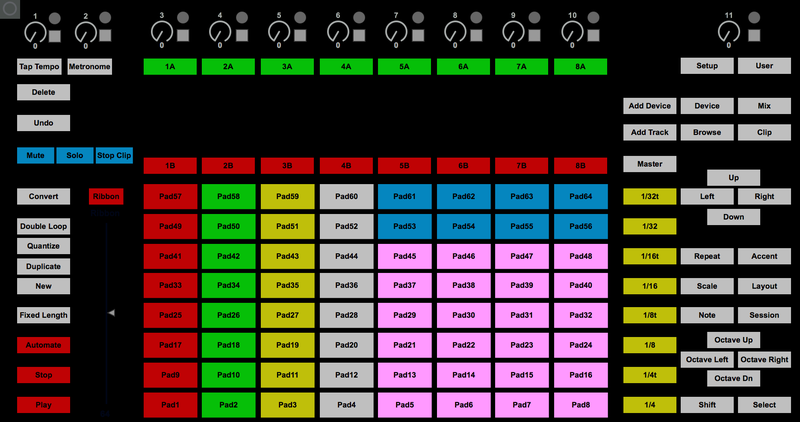 I decided to incorporate Ableton Push 2 into my Max (Cycling74.com) performance rig. Max is primarily used in my solo performances and my ensembles KaiBorg, Tpt-Tpt, The Desert Fathers, among others. To do this, I decided to create a group of Max abstractions allowing me to access Push 2 features from the Max environment. The first job was to “sniff” out the midi message required to get the Push 2 to recognize midi messages from Max. I used Midi Monitor from Snoize for this task and found the message which now resides in the jk.pushcore abstraction. (“240 0 33 29 1 1 10 1 247” for those interested.) It is now just a matter of mapping out the pads, buttons, pedals and rotary encoders. I have just started, but thought I would share my work up to this point. I will be creating a table for the Push colors to match text buttons in the future. Right now there is a limited palette for the text buttons in my patches. See jk.push-example in the archive. , but currently prefer [accum], if you have other ideas, please let me know. I also have an abstraction that works with [umenu] and allows you to have different colors for each menu item. It is currently a bit wacky, but I’ll add that to the .zip soon. There are Max objects for purchase on other sites that allow you to use the screen, but I’m looking for a free options. So, no screen access at this moment, I would appreciate any leads. The archive containing the abstractions and maxhelp files can be found using the link below. Just a reminder these abstractions are designed for use in the Max environment. My Max rig is idiosyncratic, so the patches may or may not fit your need. But if you do use them, let me know, I’m always curious.